These LeatherGrain binding covers from GBC evoke the distinctive, elegant look and feel of real leather. 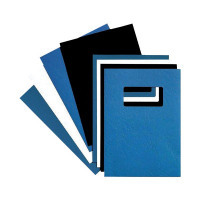 Made from a high content wood pulp and recycled materials, these sturdy A4, 250gsm covers provide exceptional durability and style to your bound documents. These binding covers feature a pre-punched front window for the title of your report, presentation or project. This pack contains 50 white binding covers suitable for use with most binding styles including CombBind and WireBind.